We get up close and personal with Steven Paul Judd, the dynamic and bold 21st century renaissance man. One of the art world’s most energetic, accessible and celebrated figures, this self-taught artist’s love for pop culture and Native American art has given him a massive following. This insightful portrait shows how Judd indigenizes the popular every day to allow our young to see themselves in all aspects of life, while at the same time making his own dreams a reality through his passion and zest for life. Kyle Bell is an award-winning independent filmmaker based out of Tulsa, OK. In the past two years since his filmmaking career began, Kyle has won back to back awards for best short documentary, and best cinematography. 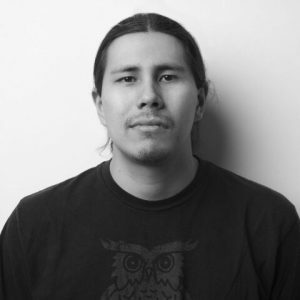 Kyle also films and edits documentaries for the Emmy-winning television program “Osiyo: Voices of the Cherokee People” that airs in Oklahoma and Arkansas.